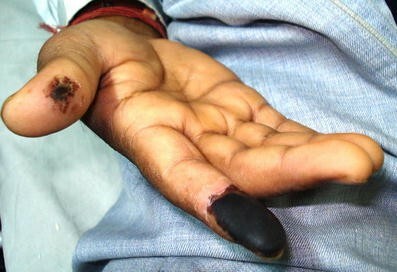 A 23-year-old otherwise healthy male presented with development of painful blackish discoloration of the right thumb and index finger and of the right big toe and area over the ankle (Figs. 1 and 2), as well as painful swelling of both lower limbs, especially on the right side (Fig. 3). Homans′sign was present bilaterally. His past history was not significant. Routine investigations, including complete blood count, coagulation profile, chest roentgenogram and ultrasound of the abdomen, were normal. 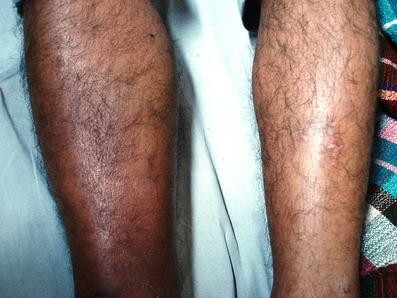 The patient presented with evidence of an increased tendency to thrombosis, both venous and arterial. Doppler ultrasonography confirmed bilateral lower limb deep venous thrombosis with complete occlusion of the right radial artery. His echocardiography and HIV serology were normal. His serum homocysteine levels were elevated at 52 µmol/l (normal, 4.4–10.8 µmol/l). The patient was managed with enoxaparin, warfarin and folic acid. Within a week, the swelling of the lower limbs improved, and the patient was discharged on warfarin. Only a few causes are known to cause both arterial and venous thrombosis, including elevated homocysteine levels, antiphospholipid syndrome, polycythemia vera, paroxysmal nocturnal hemoglobinuria, underlying malignancy and hormonal therapy.